What is in the Digital Collections? What format are the Digital Collections in? How can I access the Digital Collections? How do I search for a particular document in the Digital Collections? Will my search terms be highlighted in the digital document? How do I interpret what I see in the Search Results screen? What do VP and "virtual part" mean? What does "Bad File Location" mean? Can I bookmark an item in the Digital Collections, or save it to "Favorites", so that I can easily find it again later? How do the Digital Collections relate to the Excelsior catalog? What are some examples of Historical Documents available online? Are any of these materials protected by copyright? What's in the Digital Collections? The Digital Collections consist primarily of over 55,000 documents (approximately 2 million pages) relating to New York State. New York State Government Documents. These State publications are grouped by the agency that published them. They form the largest part of the Digital Collections. New York State Library Special Collections. These documents include selected monographs, broadsides, maps, mansucripts, and scores from the Library's Manuscripts and Special Collections, as well as other Library materials. They are organized by format and by Dewey Decimal Class (see screenshot below). General Collections. Items in this collection are basically published books that have a Dewey classification number. Other Digital Collections: You can also access other digital materials collected by the NYS Office of Cultural Education (OCE), which includes the State Archives, Library, and Museum. Collections include digitized photographs, manuscripts, and other material, mainly in jpg format. The majority of the items in this collection are from the NYS Archives, but it also includes hundreds of NYS Library images. The Digital Collections can be accessed from any computer with a web browser (Chrome, Firefox, Safari, etc.) and a PDF viewer such as Adobe Acrobat Reader. The Digital Collections are best viewed using an updated browser and a current version of Acrobat Reader. Option 1: Search the NYSL catalog as usual. If a document is available online, there will be a link to it in the "Electronic Access" field of the catalog record. Click on the link to open the document. Option 2: Access Digital Collections directly and search via the form in the left-side navigational bar, or select the "Browse" tab to browse through the collection. From the catalog, click on "NYSL Digital Collection" (in the gray navigational band). 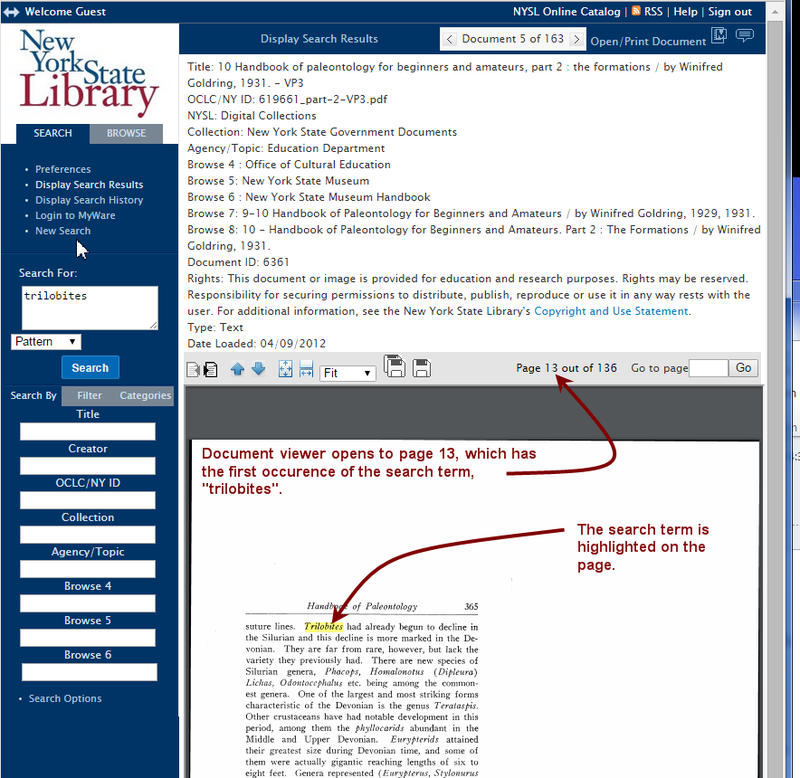 From the NYSL home page, select "Digital Collections" from the left navigation bar, and then "Search Digital Collections" from the top of the next page. When searching using the Keyword Search Box, be aware that you are searching the full text of the most documents in addition to the metadata. Try using quotes to narrow your search. If you know the title of the resource you are looking for, use the Title Search Box (see Searching the Digital Collections - Field Searches) rather than the Keyword Search Box. See Searching the Digital Collections for a more extensive description of Search features. You can continue to drill down by clicking on each individual folder to browse its contents. At all times during browse, the browse folder hierarchy in which you are currently browsing appears beneath the blue bar at the top of the screen, similar to breadcrumbs on a webpage. If at any time you want to go back up to a previous browse level, just click on the folder name link in the browse folder hierarchy. Note: A folder may contain both subfolders and individual documents. If while you are browsing you want to return to search mode simply click on the "Search" tab in the left navigation column. Searching from within Browse is another option. If you are browsing a collection of documents and you decide that you want to conduct a search, simply type your search terms into the full text search box and click the Search button. A search will be executed within the context of the browse folder where you began the search. If you are looking at the document in the embedded view, the document will open to the first page that has your search term, and depending on your PDF viewer, you may see your search terms highlighted. With Adobe Acrobat Reader, if you are using version 9, you can view highlighted search terms as long as your Adobe Preferences are set to "Enable search highlights from external highlight server." However, Adobe Reader X no longer allows search highlights from an external highlight server. Once you open the document you can use the Acrobat "Find Text" tool to locate your search terms within the document. If you click on the "Open/Print Document" link to view the document, your search term will not be highlighted. Click on the title to see the full text resource. Click on one of the Browse Levels ("Browse 4:" or "Browse 5:" in the screenshot below) to see a list of other folders and documents in that directory. Occasionally, you will see VP-1, VP-2, or the phrases "VIRTUAL-PART-1, VIRTUAL-PART-2" etc. This means that a large document has been broken down into smaller units, to make it easier to view the documents over the Web. For example, a 1000-page document might be divided into five 200-page files. In other cases, images in a document may have been scanned separately because of size, color or resolution. The content is not altered when a document is scanned in multiple parts. If you open a document and receive a "Bad File Location" message, it means the embedded Acrobat Reader cannot open the file. However, if you click on Open/print document in the upper right-hand corner of the screen and the document should open in the stand-alone Acrobat Reader. To print/save just the visible page, click on the save icon that looks like a single computer diskette. To print/save the entire document, click on the save icon that looks like two computer diskettes. If you clicked on the "open/print document" link in the upper right-hand corner of the screen in order to open the document in the stand-alone version of Acrobat Reader (or your default PDF viewer), you will have the PDF viewer's usual options for printing the document or saving the document to your computer. For Acrobat Reader, these options will be in either a fixed toolbar at the top of the screen or a floating one at the bottom, depending on your version and settings. Be aware that larger PDFs may be slow to open, depending on your internet connection speed. 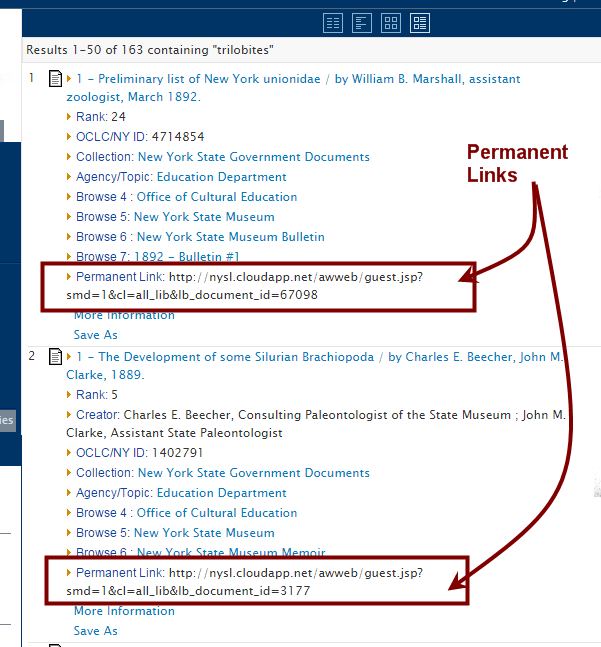 You cannot use your browser's Bookmark or Favorites function to save a link to one of our digital documents because we use a session-dependent, dynamic method to generate and open items in the Digital Collections. This means that the URL used to access documents is not persistent across time. However, the metadata for most documents will include a field called "Permanent Link." You can copy the URL in that field if you want to save, cite or share a link to the document. MyWare: If you set up a free MyWare account in ArchivalWare (the software we use to provide access to our Digital Collections), you can use the "Favorite Documents" feature to save documents you want view again at a later date. The Digital Collections provide access to select online material referenced in the Excelsior catalog. Through the Electronic Access tag, a link is made between the catalog record and the item managed in the Digital Collections. Our online catalog displays this tag and clicking on it will take you to the item. More detailed information and subject headings may be found in catalog records. Please see Historical Documents Available Online from the New York State Library. Every effort has been made to select and present material in the public domain, but some materials, including State Agency publications, may be protected by copyright laws. The Office of Cultural Education, NYS Department of Education, is providing access to these materials for educational and research purposes. The written permission of the copyright owners and/or other rights holders is required for distribution, reproduction, or other use of protected items beyond that allowed by fair use or other statutory exemptions. Responsibility for securing any necessary permissions ultimately rests with the user. 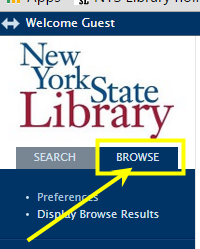 If you have other questions about accessing documents in the Library's Digital Collections, please e-mail nyslweb@nysed.gov.